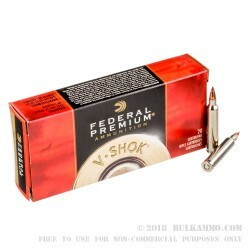 Federal Premium offers super speedy .204 Ruger ammo that gives significant performance out of your bolt gun for varmint hunting or training and target use. 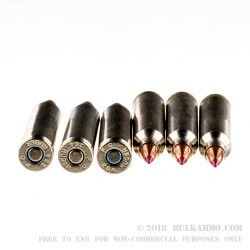 This is a round that provides substantial accuracy for a good price point on a round that while it is gaining a lot of ground on a volume metric, it is still a relatively small production caliber. The 32 grain projectile is the Nosler Ballistic Tip which gives a polymer point that controls expansion and ensures top tier ballistic coefficiency and accuracy that is hard to match. Just like the other Federal Premium loads, this is a particularly well-built loadout that oozes premium componentry and a classy look. The nickel-plated Boxer primed brass casings are reloadable and offer significant enhancement to the performance from a feeding and extraction perspective. The blazingly fast 4030 feet per second velocity of the 32 grain projectile is mated to a 1154 ft. lbs. of energy that is delivered at the bore. 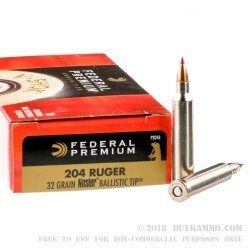 The .204 Ruger is ideal for ultra-small game including varmints and animals under the 40 lbs. threshold. At distance, this is still a potent offering for those game sizes, and the velocity and energy impact are substantial for the dispatching of these animals. 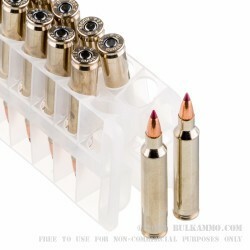 The impressive accuracy gives the hunter or target shooter a lot of leniency while engaged in these activities.